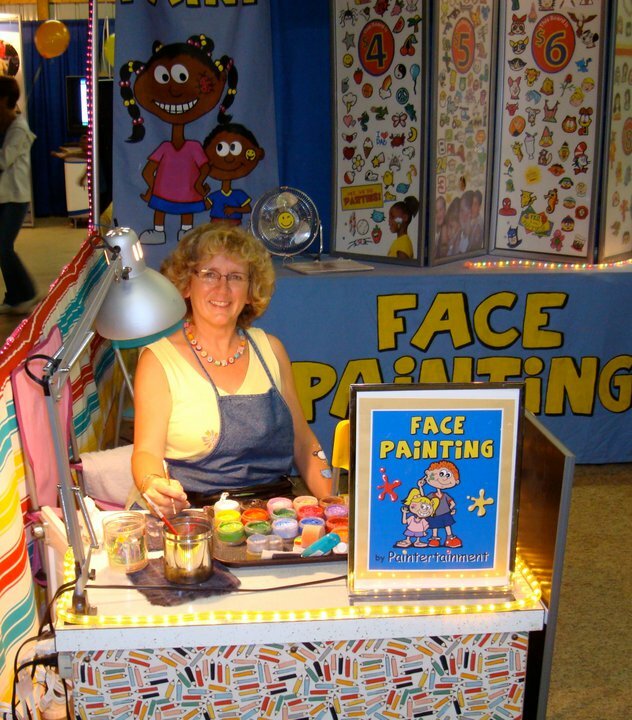 We had yet another wonderful December of face painting at Christmas events! This was my 3rd year and my mom's 1st year painting at the Village at Mendota Heights' "Mendota Lights" Christmas event! Above is a photo of the carolers that roam the mall during the event. This was also my 3rd and my mom's 2nd years painting at Axel's restaurant on a golf course in Woodbury with Santa Carlucci! (My mom and Santa, above!) Doesn't he have an amazing outfit?! Santa Carlucci can even bring his sleigh and real reindeer along. Here is a family having their photo taken in the sleigh. 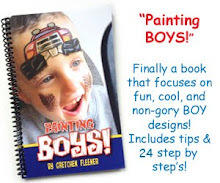 Santa sure has a way of drawing in the kids! 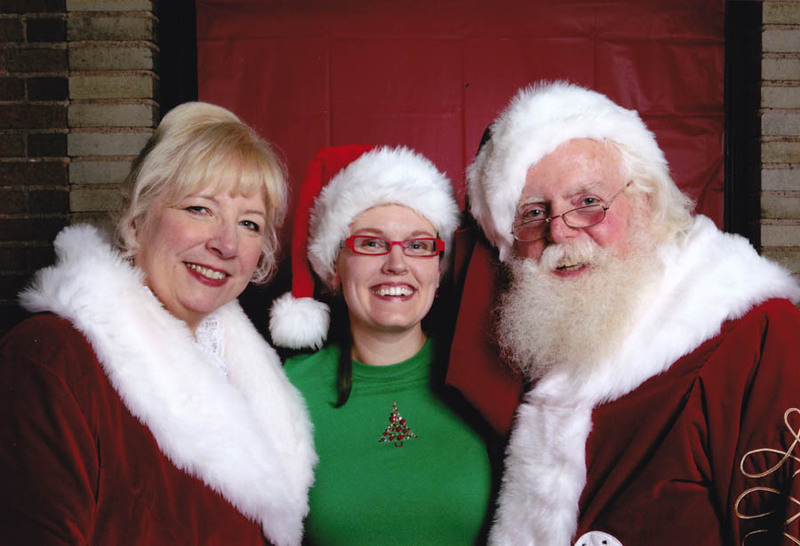 I also really enjoyed doing another private event inside a skyway above the Holidazzle Parade downtown, with both Santa AND Mrs. Claus! I am very fortunate to be Santa's face painter of choice when he is visiting Minnesota from the North Pole! Thanks Santa, for another fun Christmas season! 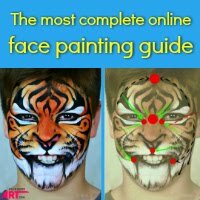 After doing a little research with my fellow professional face painters, I found that most painters who use acrylic gems in their face and body painting work use either eyelash adhesive or spirit gum. 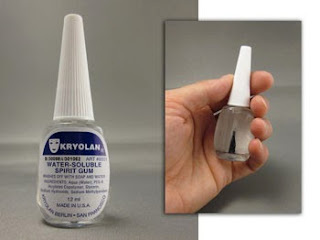 I recently added eyelash adhesive and an assortment of gems to the site, and today am excited to have just added some of Kryolan's water soluble spirit gum as well! 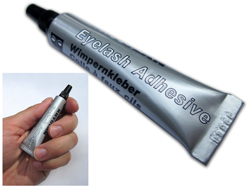 Eyelash adhesive is more expensive for a small tube, and it contains latex, so you'll have to make sure that the person you're using it on doesn't have any latex allergies. However, it really holds very well and sticks quickly...at least in my experimentation, the gems stuck the second I touched them to my skin. They also are easily removed when you want them off. 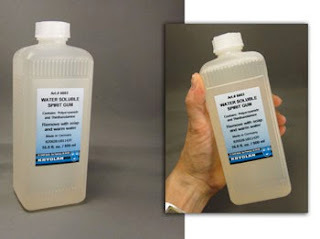 Spirit Gum is less expensive per ounce, and it does not have any latex in it. The drawback is that it takes much longer to dry. So, you may be spending more time holding the gem in place, or checking it periodically while you paint to make sure it isn't sliding down. You can now find the Kryolan spirit gum on my website in two sizes...the .5 ounce bottle with a built in applicator brush ($4), as well as the larger 16 ounce refill jars ($20) . After trying them both myself, I'd recommend having both on hand, depending on the situation you're in and who you're painting. 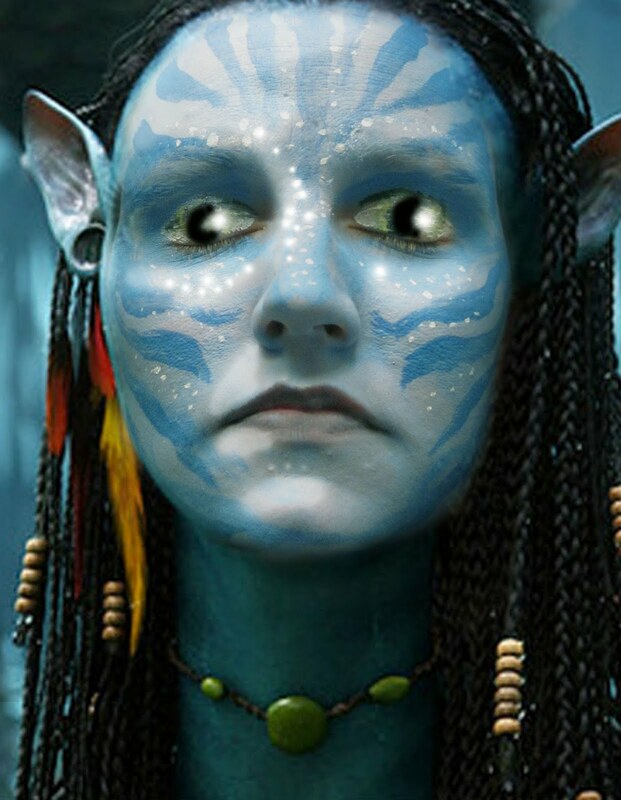 Obviously it would be a good idea to have spirit gum on hand if you have someone with a latex allergy. If you really need the gem to stay on well and for a long time, or are doing a gig where you don't have the time to wait and hold each gem while it dries, you'd want the eyelash adhesive. If any of you fellow painters out there have other tips or advice for acrylic gem adhesion on the skin, please do post your comments...I'd love to hear your thoughts! I have yet another new group of products just added to the site, in our storage container category. The first one I am very excited about. 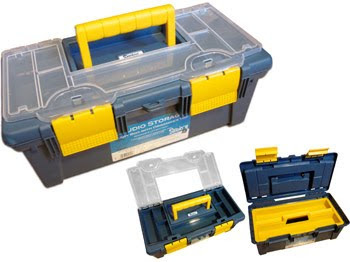 This is a storage box that comes with 28 screw-together jars for just $12.00. These are the kind of jars that I like to keep my paint in, because they stack together, and you don't have a lid for every color to screw on and off or lose. 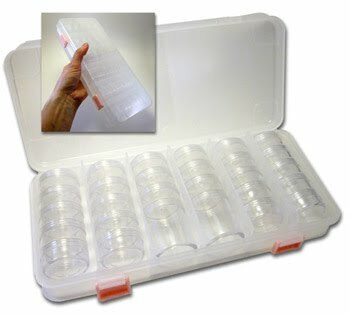 The jars are 1.5" in diameter, and come in 6 stacks, each of which fit neatly inside 6 compartments in the snap-closed container. Two of the jars are a little taller, making them perfect for storing a few acrylic gems or even glitter! I have already purchased one myself, and plan on moving my paints into this container. I can get all of my bright colors, and now I have space to add some UV-Dayglow paints and metallics all to one conveniently sized kit. I'll post photos once the "move" is over! If there's space left, you can even store glitter in here. I have 12 colors that I use at any one time so this is a great idea for that as well, especially with the jars being clear. 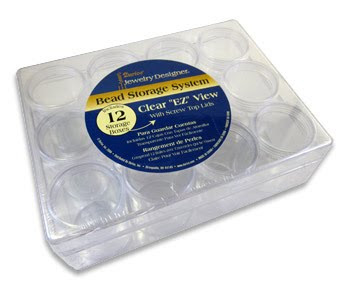 I also now have available this great box containing 12 screw-top jars for just $7.00! 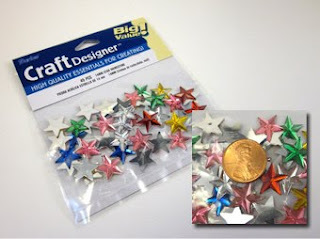 Each jar comes with it's own lid and measures about 1.5" in diameter and 1.75" in height. Right now I use little glass jelly sample jars for my glitter, but as they begin to break over time, I plan to move my glitters into this container. Like I said, I usually have about 12 glitters available at my events, so this would be perfect to hold all of my colors and keep them neatly stored together in my supply bag! Last but certainly not least is our new 16" art supply box. You can get this box as part of the new "Business Starter Kit," or you can purchase it separately for just $15.00. This box is large enough to hold your paints, brushes, glitter, gems, you name it! With it's clear snap-open storage lid and lift-out tray, organizing your supplies is a breeze! 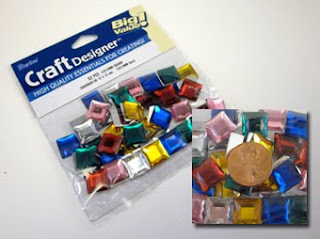 I am pleased to announce that I now have a selection of acrylic gems and adhesive available in the shop! 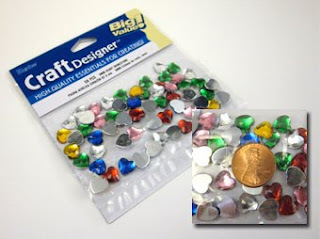 These gems can really add a lot of sparkle, especially to your princess designs. 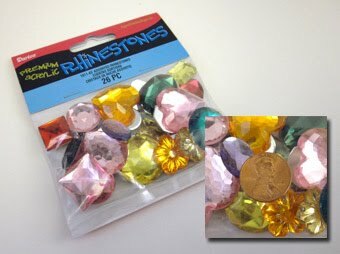 These are not the cheap peel-n-stick gems that fall off right away. They have a smooth, shiny back, so you can properly attach them safely to the skin with Kryolan eyelash adhesive. They stay on well and remove easily when you're ready! 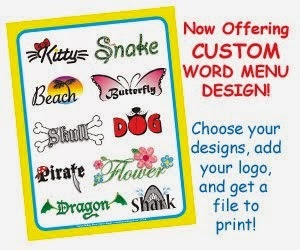 I have chosen a variety of different shapes and sizes to offer at my site! Below are some image of what I have currently, including hearts, ovals, circles, squares, stars, and variety packs. 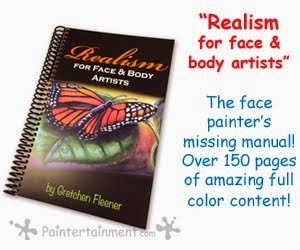 Don't see a shape or size that you like to use? Please let me know! I'm looking for more ideas as far as what other shapes to carry. 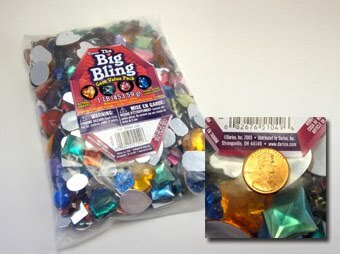 I have included photographs with a penny shown so that you can easily visualize the size of each gem. 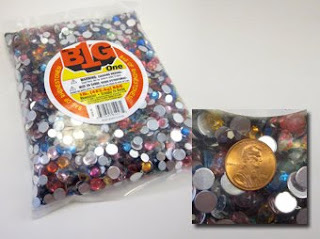 We also have these large 1 pound bags below for just $16.00. These packages do not list a quantity, so I can't tell you exactly how many are in there, but it's a BIG bag that is sure to last you a very, very long time! 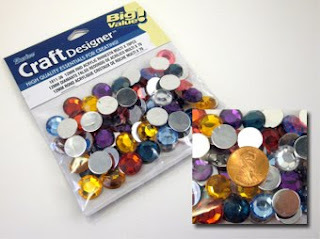 They are available in an assortment of different large shapes, as well as a bag of various round gems! I am soooo excited to start using these gems in my designs and start offering up special princess party packages. 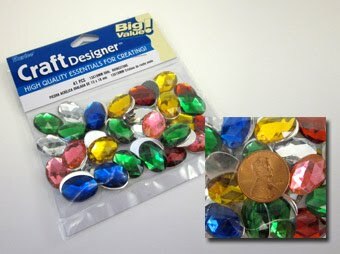 These gems will be the highlight of my princess and crown designs! Save Over $30.00 On Our NEW "Business Starter Kit!" I am pleased to announce another new product offering to our growing selection of new fall additions...the "Business Starter Kit" professional face painting supply set! 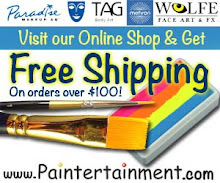 This is an incredible deal that you will only find at Paintertainment. 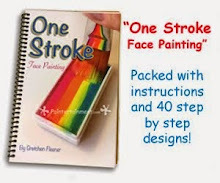 While I created the "Smile Painter Set" for beginners looking for quality supplies, this kit is geared toward the budding professional, looking for a set that will give them the most for their money when they are starting up their business. Packed with the essentials you need to get going, I have also included a list of other optional items you may want to add to your set. 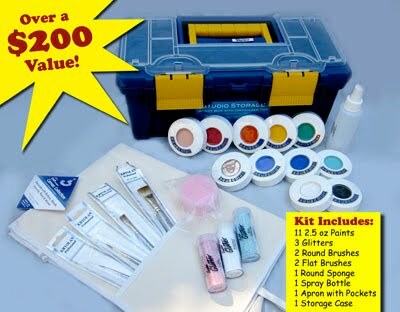 This kit comes with over $206.00 worth of paints for only $175.00, which means you save over $31.00! The kit includes eleven of our large, 2.5 ounce Kryolan Auqacolor paints, two round brushes (a #2 and a #5), two flat brushes (a #12 and a #28), one round makeup sponge, three 1-oz jars of glitter (pastel pink, pastel blue, and blue-violet), a canvas apron with pockets, a spray bottle, and a 16" storage box with a lift-out tray and clear storage compartment lid! There are not many businesses you can start with such a small amount of money, and this is our little way of helping you get started for a small investment! 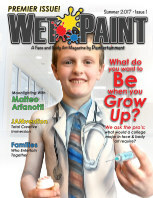 Order your kit today at Paintertainment.com! I've just added another new product to the shopping site...empty 24 color palette boxes for $20! I recently started carrying the 12 color and 6 color empty palettes, and they have become a popular addition to my inventory. So, I decided to add in the 24 color box as well. 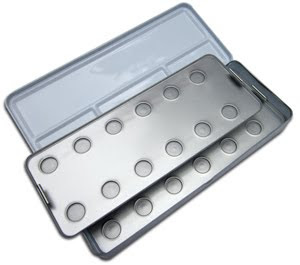 These metal boxes are designed to hold the Kryolan palette refills, also available on the site. Purchasing these boxes empty allows you to create your own custom palette of colors, once you fill them with your desired refills! It's super easy to fill these palettes and swap out colors...simply snap the refills into the round depressions in the metal palette. 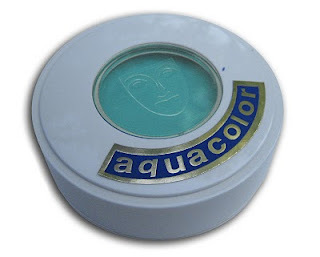 The option of creating your own palette gives you the opportunity to mix and match the basic colors, UV Dayglow fluorescent colors, Interferenz and metallics. The possibilities are endless! I am pleased to announce the addition of two new paint colors to our selection of 2.5 oz Kryolan Aquacolor professional face paints! I have just added a light flesh tone (#01S) as well as a very nice teal (TK2) to the website. Both are available now at $12.00 for a large 2.5 ounce size...check them out! The flesh tone is perfect for the skin color of many popular characters, such as princesses, etc. Just a little bit of red added would turn it into a nice pink. The teal is great for flowers, butterflies, and mermaid tails! I usually mix most of my own colors, however, teal has always been a tough one for me to get just right. It usually turns out leaning more toward green or blue. But, this one is perfect on it's own! I am pleased to announce the first of many new product introductions to the website to come this fall...three new glitter colors to choose from! We now carry gold, silver and Mahogany! I've always felt that my rainbow of glitter selections was not quite complete without a brown, so we now have a nice mahogany available. We also are finally carrying both silver and gold, two colors that I know many face painters have in their supplies as glitter staples! If you check out the glitter aisle of my store, you will notice that I've now cleared a shelf to make way for more new product...gems and jewels! I will soon be carrying the little acrylic gems that many painters like to use to kick their designs up a notch, especially princess designs. Stay tuned for this fun new addition, coming soon!! 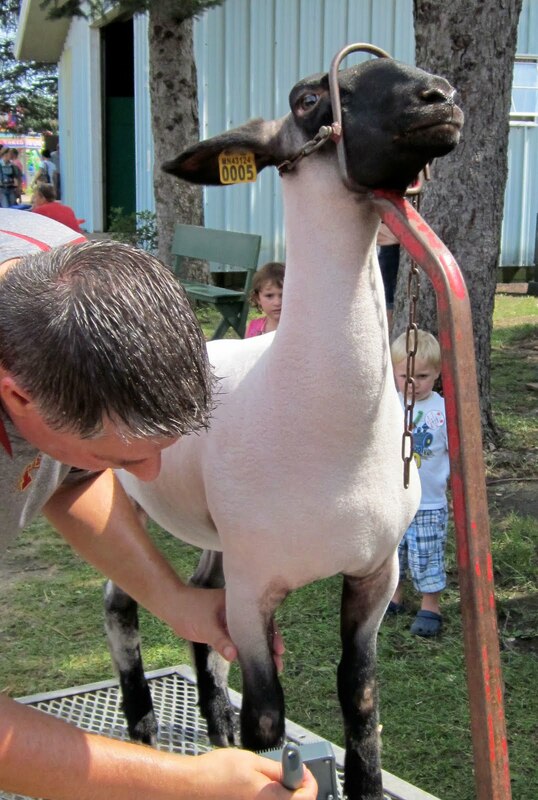 Another Dakota County Fair has sadly come to a close! I had a great time painting again this year. It's definitely harder for me now that I have 2 kids, plus one who is still nursing, to be gone so much. 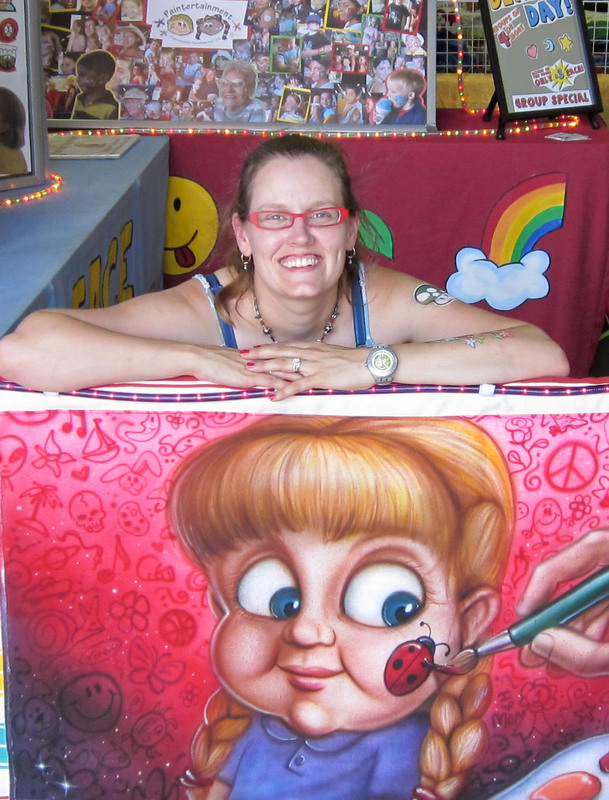 But, I am very thankful to have had my mom painting with me again this year, so I could spend a few half-days and a full week day with my boys, knowing the booth was in EXCELLENT hands! This year was our 2nd least profitable year...I think it was a combination of the extremely hot weather and the not-so-hot economy. Regardless, I always am glad I did it in the end. While it makes me feel a little old, it's fun to paint kids in 4th or 5th grade who have been painted every year since they were old enough to sit still! It's also a lot of fun to see faces from my past. Every year is like a class/family reunion, spending a week in the county where I grew up. 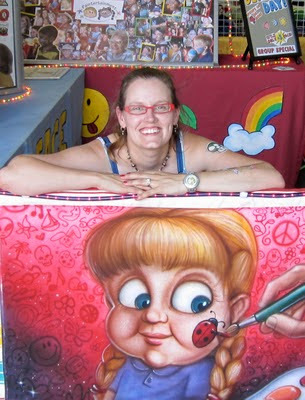 In addition to my fabulous artist mom, I couldn't do this without my super supportive husband. He really IS supportive, literally, as you can see here...supporting our 7 month old and my boards, tearing down the booth Sunday night! He takes time off from his very demanding job as a director to be with our boys when I'm at the fair. He even drove us from Ohio back to Minnesota for the fair every year for the 4 years we lived out there. He does everything he can to support my business ventures, and I am so grateful! I'll close off my last county fair post for the year with a few shots that I took around the fair!